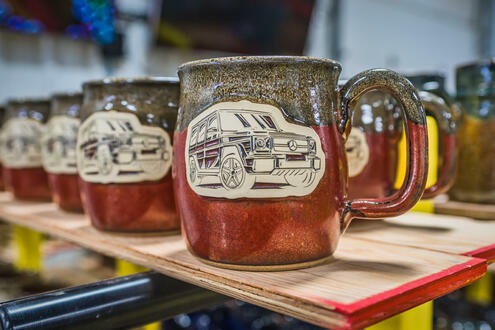 Whether you've only just discovered Sunset Hill Stoneware or you're a repeat customer who has been ordering mugs for years, it helps to know the possibilities of what to do with stoneware mugs to help your business or organization. Stoneware mugs make great souvenirs for gift shops and home stores. Since they are a high-quality, handmade item that can safely be put in the microwave, dishwasher and oven, these unique coffee mugs command a higher price point than printed mugs and last much longer. Customers see this quality for themselves and feel it when they pick up your logo mugs, so they're happy to pay more a better product. The number of novelty coffee mugs you'll find in the United States from Sunset Hill Stoneware is genuinely staggering. 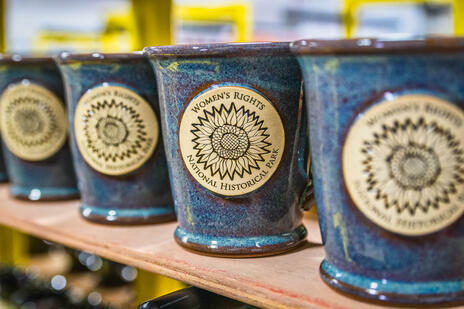 From national historic sites to locally owned shops, Sunset Hill Stoneware mugs make high-quality souvenirs, gifts and impulse buys. Some collectors have even been known to go on road trips just to find new unique mugs to bring home with them. Creative coffee mugs can even be found in many of America's parks. The Potbelly awaits visitors in multiple different colors depending on the parks they visit, and with medallion designs unique to each site. Some place, such as Minute Man National Historical Park, even use stoneware beer steins as historical examples of what people used for drinking during the American Revolutionary War. Unique mugs are also found at state parks in all 50 states. These state park mugs often depict the wildlife or natural wonders seen during your visit to the park, so visitors can take a piece of their trip home with them and support conservation efforts in the park. Not to mention, Sunset Hill Stoneware has the fastest delivery time in its industry, with an average turnaround of 5-7 weeks. If you're looking for product to stock your shop and it's getting down to the wire, we can get your mugs to you so you can stock your shelves in time for the next big event or holiday. Sunset Hill Stoneware's mugs make great fundraising tools for nonprofit or community organizations. Seeing as our mugs are a higher-end, better quality product, they're a more appealing fundraiser gift or reward than printed mugs. People are also willing to pay more for these mugs because they're handmade by skilled craftsmen in America. 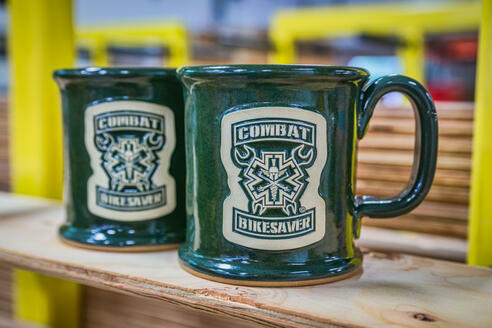 In recent months, Sunset Hill Stoneware has begun working with the nonprofit Operation Combat Bikesaver. 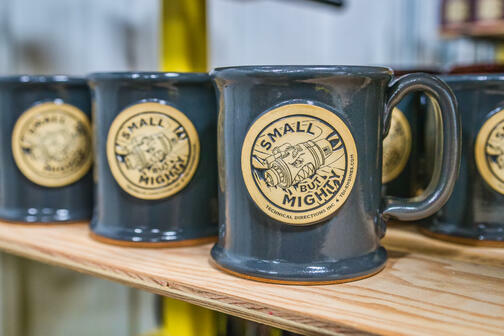 The organization uses their Straight Shot mugs and Ale House Barrel steins in some of our most popular shades of green to highlight their mission statement—to bring relief to veterans with PTSD, traumatic brain injuries and other combat-related mental illnesses. Every Sunday, participants gather at the organization's site in northwest Indiana and work together to refurbish old motorcycles. This form of "hot rod therapy," as company president and military veteran Jason Zaideman calls it, lets combat veterans find a sense of wholeness and purpose in a family-style group setting. The volunteer-based company sells their mugs and steins in multiple shades of green to cover their expenses so the veterans don't have to pay participation fees. Custom stoneware mugs have also been a hit with law enforcement organizations. Municipal police departments, such as the Lincoln Park Police Department in Lincoln Park, Michigan, sell their mugs as a fundraiser tool to help support their community policing program. This program helps connect the precinct's officers with members of their community in suburban Detroit, including local children. Through selling these stoneware coffee mugs, the LPPD is able to supply children with backpacks when it's time to go back to school and organize community meetups for coffee, skating and more. The stoneware is more eye-catching and higher quality than traditional mugs, so the higher price point brings in more money for the department to give back to its community. Whether you run the best bed and breakfast in the United States or you want to show appreciation to your employees at the office for their hard work, our beautiful coffee mugs make excellent gifts. Finding good corporate gifts can be difficult, especially in a market saturated with cheap printed flashlights and pens. The best way to show appreciation for your employees is to offer them high-quality gifts. Our mugs are just the solution for this—some of our customers even report that their employees don't want to lose them after receiving them, and they continue to mention them months or even years after the fact. Such was the case with one of the departments at Essity, a paper products company with plants in Neenah and Menasha, Wis.
One of Essity's production departments used the mugs as part of its Stop Think Act campaign, designed to promote workplace safety while maintaining and improving productivity. The mugs weren't rewarded to team members all at once, however—instead, they had to be earned individually. It was an effective solution though, with recipients reacting more positively to the mugs than they had to lower logo gifts they had received in the past. Our custom coffee mugs may be a bigger purchase for your team than pens, can koozies or other printed gifts with your logo, but they'll make your employees and clients feel more wanted than any other branded gift. With turnover costing the average business thousands of dollars per person, the benefit of investing a little more in gifts to show your employees you appreciate them far outweighs the cost. Whether you're giving them to clients at a trade show or offering them to members of your brewery's mug club, unique coffee mugs with your logo on them make excellent promotional products. 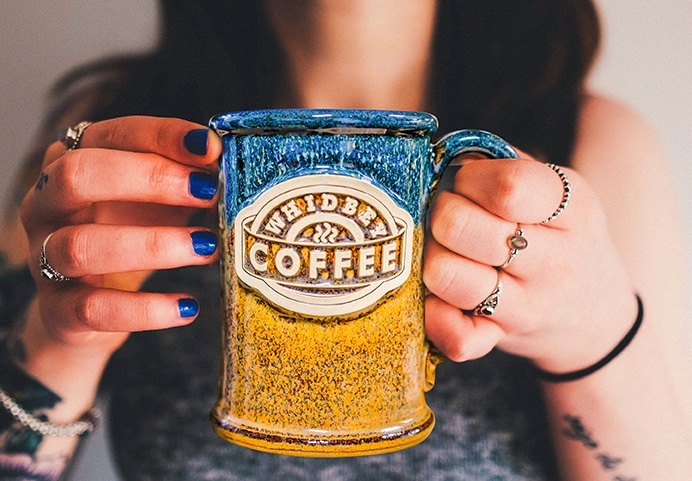 Even on their own, standing out with your logo on a clay medallion, the unique coffee mug designs send a message to anyone who holds them that you and your business care about quality. They're invaluable tools on sales calls and at trade shows where everyone who passes your booth can get a strong first impression of your brand. Wherever your mugs may go, they'll act as a long-lasting piece of advertising for your business. Even if it's just to get the first impression of your business into the minds of your future customers, they make a simple but effective form of advertising that could bring in revenue potentially for years. If you haven't tried using stoneware in your business before, now is a great time to start. On top of the high quality of our custom stoneware mugs, we also offer introductory pricing for new customers. You'll be able to see how effective of a branding tool and product these unique coffee mugs can be, all with reasonable starter pricing and the fastest delivery times in the industry.